Make a bold statement to your home decor with this Table Vase. 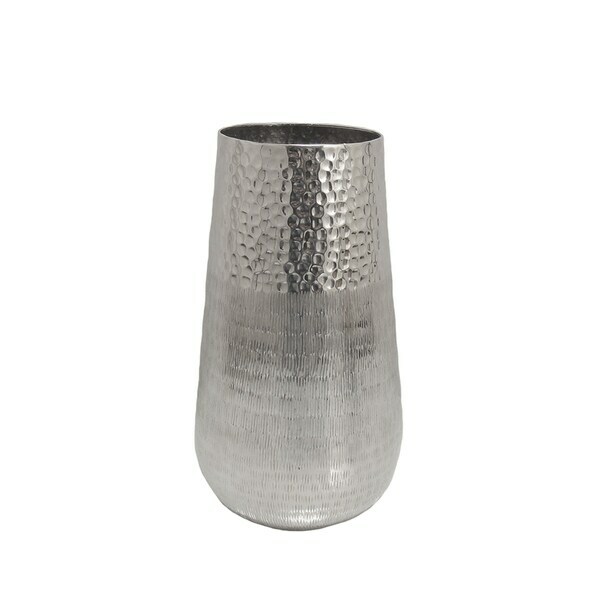 Constructed from solid metal for durability, this vase features a richly hammered silver finished surface that brings texture and dimension to its design. The vase is beautiful in any type of decor and it will surely fill your home with elegance. Besides being perfect for display on your console table, book shelf or entryway, the vase can also be a great gifting solution for your near and dear ones. It consists of one Table Vase only. The vase is constructed from solid metal for a lasting durability. The vase features a richly hammered surface that brings texture and dimension to its design. This vase will be a unique decor for your shelf or tabletop. Dimensions 6.75 In. X 6.75 In. X 12.25 In.